This morning before letting the cats out to play, I discovered a cobra racing across the garden like the proverbial racing snake. 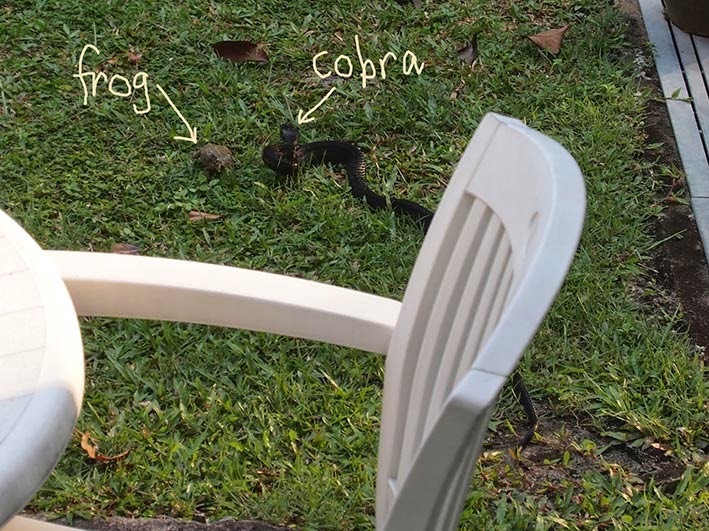 After calling pest control, I grabbed the camera to record its activities which included harassment of our resident frog. The cobra nipped the frog a couple of times and even picked it up in its jaws, but the frog remained motionless and amazingly the cobra lost interest. I was sure it was the end for our little friend who regularly helps Mrs M with her plant watering of an evening. The snake slithered off into the bushes at the back of the garden as pest control arrived. There was little chance of finding the cobra in the undergrowth. Hopefully Abbey, one of our Omani street cats who has already been rescued on two occasions from battles with cobras, will not encounter this chap on her neighbourhood patrols. Hmmmmm, that's a little close for comfort!